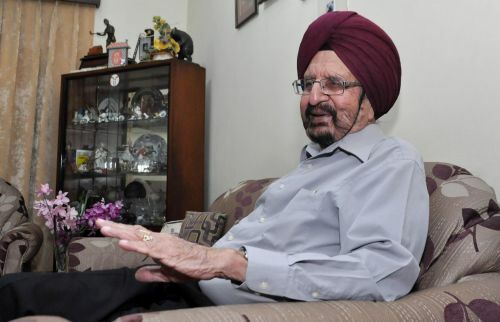 Kolkata, Feb 27 (IANS) With the Hockey Series Finals under the scanner in the wake of India-Pakistan tension, former India captain Gurbux Singh feels it's a "shame" that players aspiring to take part in Olympics might have to suffer because of the deadlock, and insists that India should play Pakistan in international events and thrash them. Since the Pulwama attack on February 14, tension between the two neighbouring countries has reached a crescendo. As a fallout, the Indian government denied visas to two Pakistani shooters scheduled to take part in the Shooting World Cup, resulting in the International Olympic Council (IOC) suspending the country from hosting all future international competitions. The Hockey Series Finals, slated to take place in June this year in Bhubaneswar, is one of the qualifying events for the Tokyo Olympics. The top two teams from the event would advance to a 14 team, double-headed play-offs with seven qualifying for the 2020 Games, making it crucial for India to host and participate in the eight-team June 6-16 competition. "There are international commitments which we should fulfil. We will not take them on in bilateral series," Gurbux told IANS. "You are destroying the careers of the players of your generation. This is a matter of shame. Many of them playing Olympic qualifications won't ever get a chance again," the 83-year-old 1964 Olympic and 1966 Asian Games gold medal winner said. The shooting World Cup though lost two qualification quotas in the 25m rapid fire pistol event while the Asian Tour 10 Reds Snooker next month has been postponed after the organisers were unable to confirm the entries of six Pakistani or Pakistan-origin cueists. "We are playing into their hands by not playing them in international competitions." "Let them come. It is our commitment. We are not extending friendship. We are not playing them in bilateral series. But we will play them in international tournaments," said Gurbux. Gurbux was part of the Indian team that beat Pakistan in the final of the 1964 Olympics and led the 1966 Asian Games team to another famous victory over their eternal rivals. "In 1965, there was a war. Our camp was there in Jalandhar. I was supposed to captain. In 1964 we beat them and after the 1965 war, in 1966 Asian Games again we beat them," he recalled.